A senior director at Aberdeen City Council has resigned, BBC Scotland has learned. It is understood director of commissioning Frank McGhee was the director suspended pending a full investigation by the local authority earlier this month. He was one of four directors working underneath chief executive Angela Scott. He oversaw delivery of council services. 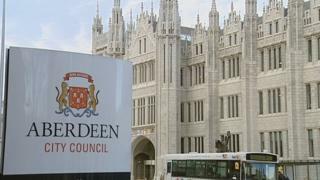 Aberdeen City Council confirmed in a statement: "The council's director of commissioning, Frank McGhee, has resigned from his position at Aberdeen City Council."